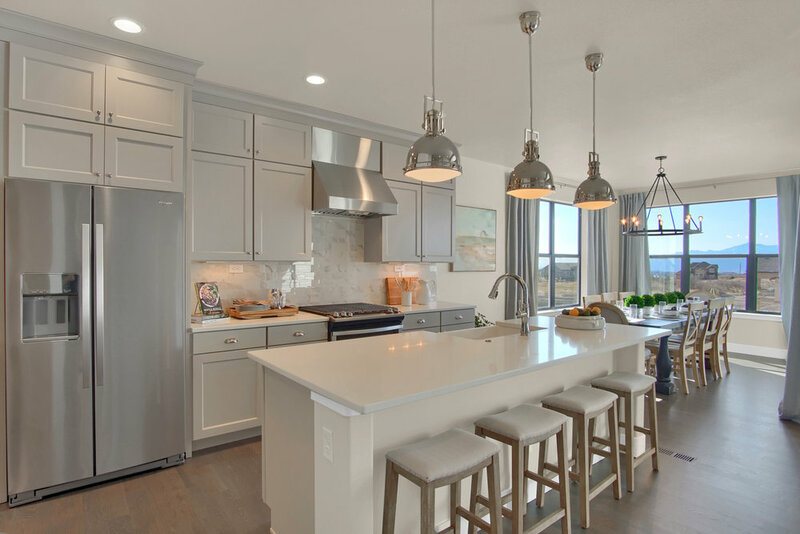 It has been an exciting year for Keller Homes as we’ve debuted four new model homes across our communities in Élan, Cumbre Vista and Cordera. As the newest ranch plan in our Modern Farmhouse collection, the Mackintosh model in Cordera combines classic farm elements with a modern edge. The neutral palate is on-trend, yet refined. Bold, yet welcoming. We hope you enjoy it as much as we did bringing it to life! From the moment you walk in the front door, you’re greeted by impressive 12-foot ceilings. A dramatic fireplace featuring floor-to-ceiling detail anchors the spacious great room. We love the oversized sliding glass doors, which lead to a generously-sized deck. The adjacent, innovative kitchen boasts 9-foot ceilings, Whirlpool stainless steel appliances, a generous island, walk-in pantry and ample cabinetry. Greige cabinets and a marble-look tile backsplash highlight the multitude of options we offer in the Keller Homes Design Studio. A spacious mud room and separate laundry are designed for comfort and convenience. These workhorse rooms offer ample storage and function - from built-in cubbies and seat to cabinetry - all while keeping the style of the rest of the home. The main level study offers a cozy space to relax and watch television. (We love the glass french doors and fun patterned carpeting!) We carried hardwood into the spacious and sunlit master bedroom; the adjoining master bath features “his and her” vanities with quartz countertops and a spa-like walk-in shower. Also on the main level, the guest bedroom feels spacious (9’ ceilings) yet private. Family and friends will love the finished lower level with oversized Rec Room featuring a wet bar and space for multiple uses, two additional bedrooms, bathroom, and storage area. Don’t miss all the charming tile floor in the bathroom or prefinished hardwood in the study area! Interested in learning more about the Mackintosh? Visit our model home (click here for directions) or contact us today. We’d love to welcome you in!